It’s that time of year, Spring has sprung, the rain has settled upon us, and the flowers are starting to sprout. This week we decided to tackle the infamous Ben & Jerry’s Vermonster (a top 100 things to do at UVM before you graduate), in lieu of Free Cone Day on April 10th! Ben & Jerry’s has celebrated free cone day since 1979 and this year, the tradition continues. This day is celebrated around the world at various Ben & Jerry’s scoop shops in 35+ countries. Wow, now that’s a lot of free ice cream! They will be serving free cones from noon to 8 pm so make sure you stop by your local scoop shop to celebrate the 40th anniversary of this Vermont tradition! And with that in mind, we thought, why not go even bigger and eat a Vermonster? Creating it is a work of art in itself, consisting of 20 scoops of any flavor, 4 different toppings, nuts, hot fudge, cookies, brownies, banana, whipped cream and caramel. Want to build some muscle while at work? Just head on over to your local Ben & Jerry’s and become a scoop shop professional and work out those arms! We opted not to include all of these yummy additions in our Vermonster (bananas in ice cream? – not our thing), but we did choose the classics for the base; Americone Dream, chocolate, vanilla and strawberry ice cream. The toppings included rainbow sprinkles, m&m’s, peanuts, cookies, brownies, fudge, topped with lots of whipped cream. Pretty breezy right? Want to see us eat this monstrosity?! Check out the time lapse video we made of us conquering this feat. *hint* we shared this with a few other folks. P.S. if you haven’t been in the Church Street Ben & Jerry’s recently, they added a VW bus. Vroom Vroom! Until next time! This week we are launching a new series where we visit our favorite Burlington haunts, bring one of you with us for lunch, and discuss why these spots will always have a place in our heart. Burlington has a lot of great eateries, so it’s easy to associate your time at UVM with lots of great food. We are still finding new restaurants, while also revisiting old favorites and want to share that experience with you. Our first stop is Henry Street Deli! In case you didn’t know, Henry Street had a fire about a year ago, and thankfully without too much damage. They had to close for what felt like forever, but this provided an opportunity for some renovations. It’s still the same Deli we all know and love. It has been a year since I graduated and decided that I wasn’t ready to leave Burlington. Right now I am a graphic design intern for the Annual Giving Team at the UVM Foundation. I do things like design letterheads, inserts, logos, case statements, blog videos and other web graphics. I really enjoy it and I have learned so much the past few months. Why did you choose Henry Street? I picked Henry Street because recently I moved across town and haven’t visited since they reopened. I needed to check out the new digs and get my favorite BBQ chicken sandwich. The Henry Street staff is great. They are true sandwich artists, master crafts people. Sometimes, when I am feeling adventurous and not wanting my classic BBQ chick I’ll get a wildcard: a specialty sandwich made by the Henry Street employees after asking you a few questions about your preferences. It’s like the surprise of what’s inside the cereal box, I have yet to be disappointed by a Henry Street Wildcard sandwich. It’s also great because they have everything you need, if you run out of toothpaste or toilet paper even beverages. You can get it all in this one stop shop. Us waiting patiently for Dana’s sandwich, so we could all eat together. Dana: BBQ Chicken with bacon. 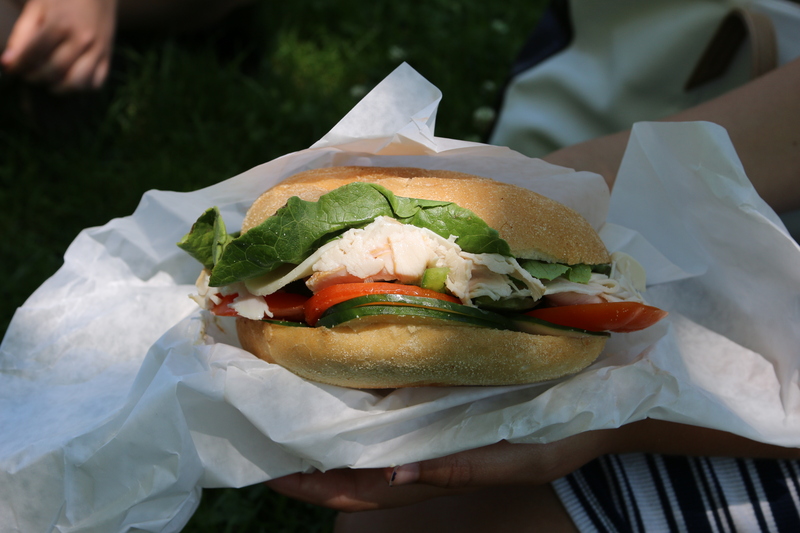 Kathryn: Oven roasted turkey, provolone cheese, lettuce, cucumbers, tomato, green peppers, and pesto mayo. 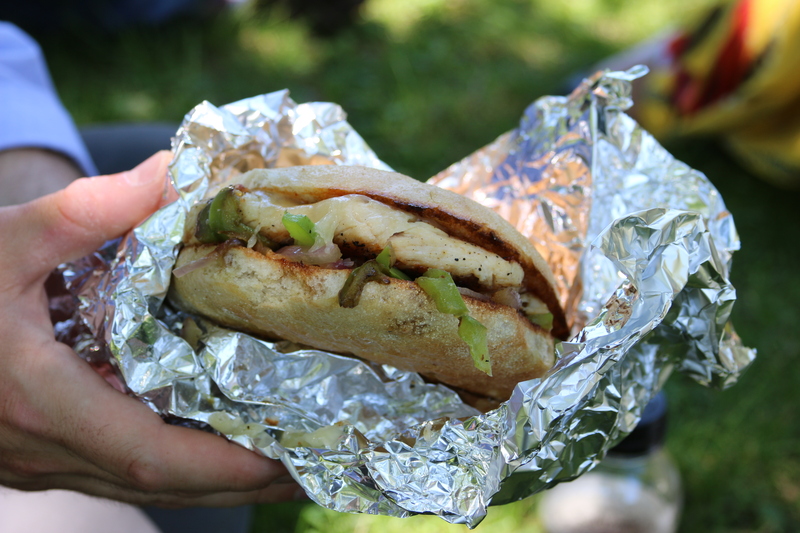 We took our spoils to Pomeroy Park, and found a nice patch of grass to eat, and reminisce about our favorite memories of Henry St.
Why does Henry Street have a special place in your heart? 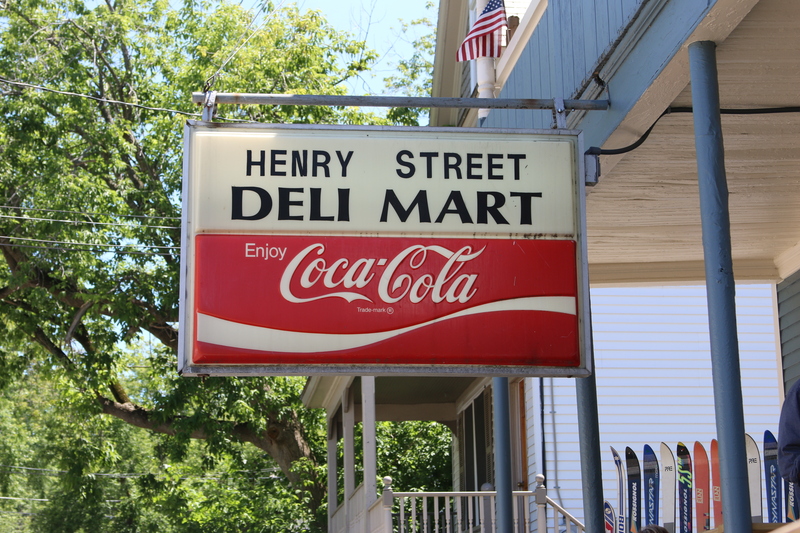 Dana: Henry Street has a special place in my heart because they basically fed me for a whole year. It’s quick and you can grab it on the go. The best thing is calling ahead and then your sandwich is ready when you get there. It’s like magic. Henry Street is the one constant in my life. Ryan: I didn’t live downtown until I moved back up to Burlington (Redstone Apartments, represent), so I never got the undergraduate Henry St. experience. Luckily I lived nearby during grad school and honestly ate there every weekday during the fall and winter. It was just WAY too good. Each morning on the way to the library (being at the library was my job) I would order two breakfast sandwiches on english muffins: one with bacon, egg and cheese, and the other with sausage, egg and cheese plus ketchup. 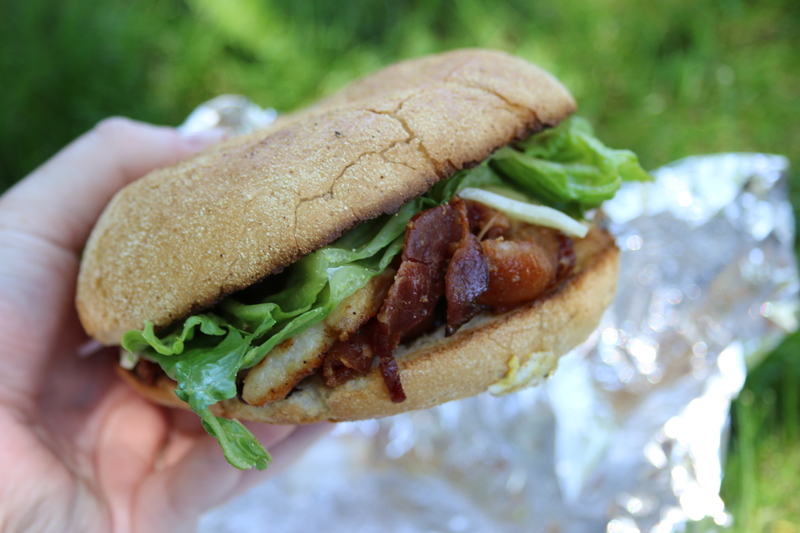 Nothing fancy, but somehow the flavors were extravagant, the heat of the sandwich cutting through the crisp morning air. I have fond memories walking up the hill eating one, and then scarfing the second and washing it down with a large coffee in the library later in the morning. Even if the sandwich was cold, it was delicious. That combo will be forever connected to my studies. Now, every visit is a nostalgic reflection of yesteryear. Kathryn: Henry Street was a weekend staple during my Junior/Senior year of college. No matter how hard my week had been with exams, papers, or the general struggles of college life, I could always rely on a Saturday morning walk to Henry Street Deli to clear my head, and a beautiful sausage egg and cheese breakfast sandwich to be waiting when I arrived there. After college, my weekend relationship with Henry Street changed a bit. 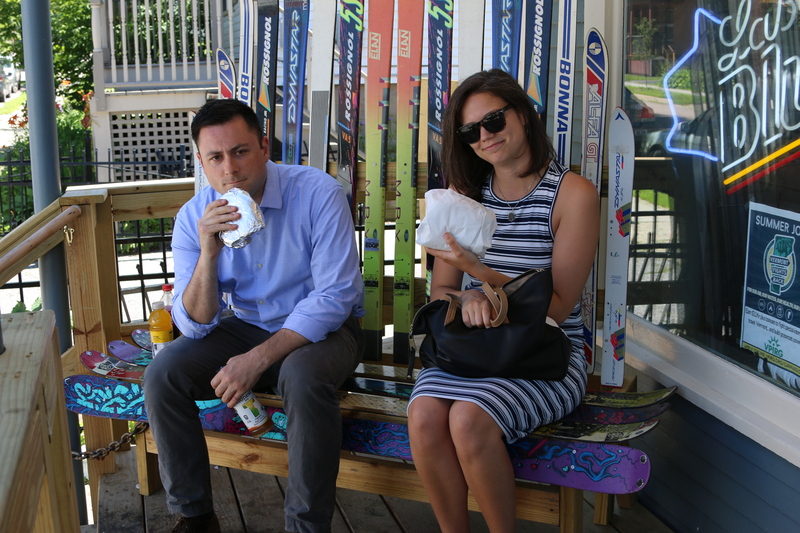 Now, my boyfriend and I usually swing by to grab a large sub before we head to the beach for the day, and it will feed us ALL DAY ( Trust me, that small sandwich had a full pound of turkey in it- their large sub is the size of a small child!). We’re hoping to get out and visit all the classic Burlington eateries this year, but to do that we’ll need your help. Sign-up to come to lunch with us and we will pick a random winner to join us for next month! Where will we go next…it’s up to you! Remember when we politely asked you to make a gift to UVM and get argyle socks in return? Well, we kind of went crazy with all sock-related stuff last month and have a free pair of Boston Red Sox tickets to raffle off. That’s right. 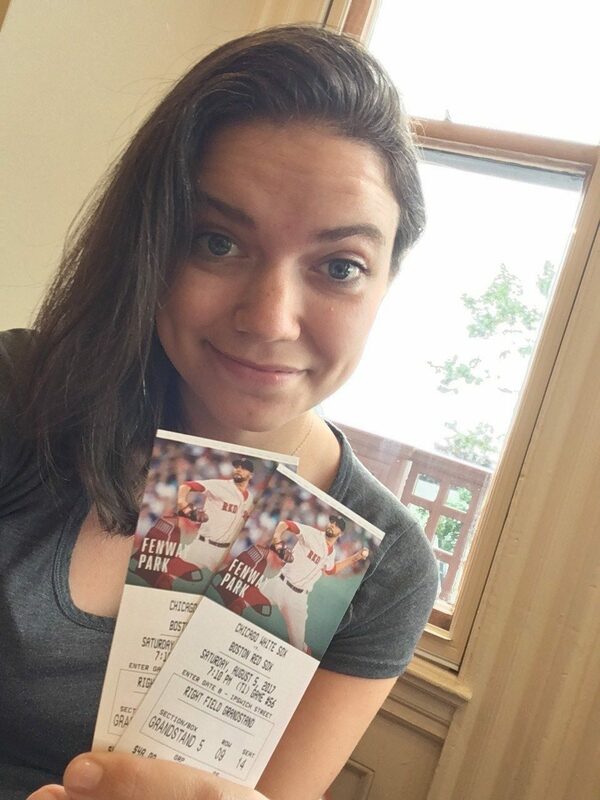 A free pair of Red Sox tickets!! The game is on Saturday, August 5th and it’s Vermonter Day at Fenway. There’s a pre-game reception with other UVM alums and the game starts at 7:10pm. You may love the Red Sox or hate them (I’m not sure there’s an in-between) — either way, this is a sweet giveaway. But before you enter our raffle, even more big news! We have a new co-host on the blog, Class of 2015 alum and Boston native Kathryn Meader. So as you can see from the picture, she actually has the tickets. 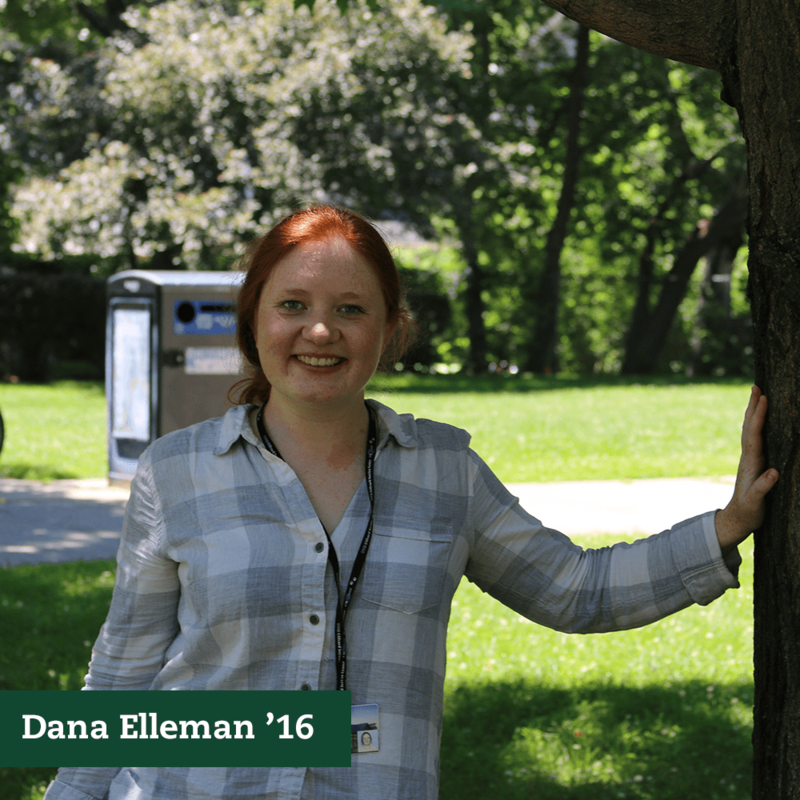 Kathryn joined our team as Assistant Director of Annual Giving at the Foundation, and as a recent UVM grad, we thought, who better to help host the blog? If you want to learn more about Kathryn, check out this week’s post for the 2017ers where she tells her “my first year out” story. We are really ramping up for an exciting time here at Afterword, so stay tuned! And now, without further ado…go ahead and enter the raffle for Red Sox tickets! Remember Free Cone Day On Campus? Hey everyone, I’m sure many of you remember waiting in line outside the Davis Center every April to get your free cone (or multiple free cones). It was surely a tradition for UVM students and lots of fun. I’m here to share some sad news. The scoop shop on campus is closing later this year, so free cone day on campus will be no more. The good news is, the Church Street shop is reopening after a winter of renovations, so you can still get your cone in town — but campus will not be the same.